BAT - BLOG : BATMAN TOYS and COLLECTIBLES: #BATMAN - CLOWN ON A HOT TIN ROOF - A New Harley Quinn / Joker-Inspired Poster! #BATMAN - CLOWN ON A HOT TIN ROOF - A New Harley Quinn / Joker-Inspired Poster! In the Comic Con Cosplay world there is a team known as "Harley's Joker" and "Joker's Harley". They are easily some of the very best Cosplayers out there. Their costumes and make-up are always amazing and they really seem to totally get into it, ha! We have talked about them before here but this post is mostly written to share some news about a special POSTER PRINT they have made recently titled, "CLOWN ON A HOT TIN ROOF". 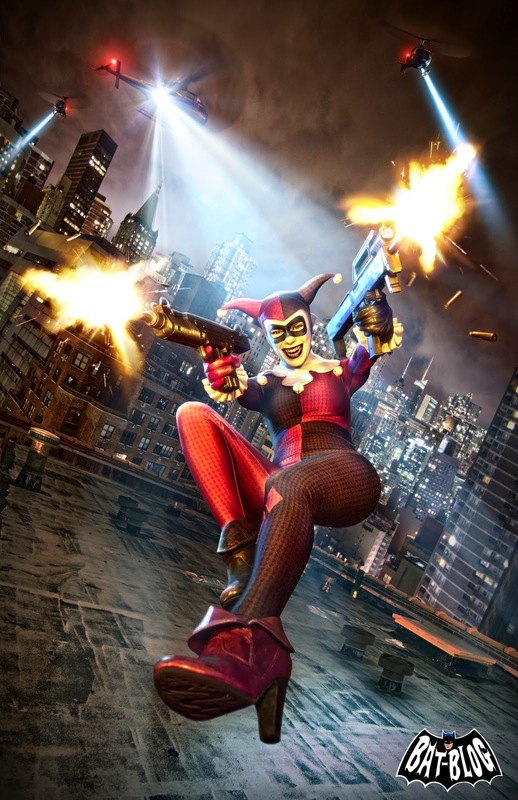 It features Harley Quinn in a major action pose. It appears she has the Gotham City Police Department on her tail, ha! The details and sharpness are really excellent. Check it out up above, it's pretty INTENSE!! For ordering information please be sure to visit HARLEYSJOKER Facebook Page and also let them know that the BAT-BLOG send ya, just CLICK HERE!